Thanks for the detailed review. :) I think I might need it because I've got fine lines and possibly building wrinkles. I hope not though! The cream looks lovely. I prefer thick creams over thin creams because it feels better over the skin. You're welcome. I think I would need to use it for a longer period of time to be able to assess its effectivenes in scar reduction. At the moment, I'm only using it every three to four days on the face, and it's only been about a month. @London's-beauty: The creams will last at LEAST a year, especially if kept cool and dry. However, as they contain natural oils and extracts, I suggest to use them up within 6 months after the jar has been opened and before the "best before" date. The oils and extract are most potent when fresh. Let me know if you have any other questions! Sounds good to me! I love the natural scent of roses! Its sensual and calming to the senses. Looking forward to the launch of new product range of MuLondon. Custom blending sounds great to me! Hi there! It's lovely to see you here. 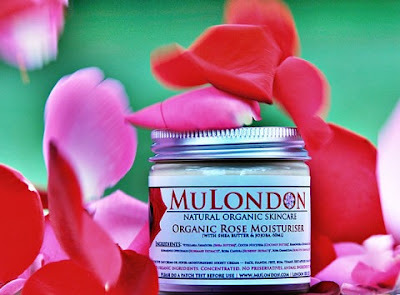 A brand like MuLondon is certainly perfect for you and your lifestyle as its products are not only natural and organic, but also cruelty-free and vegan. MuLondon is based in the UK. It ships worldwide too at reasonable rates, in my opinion. Well, I think it's a fantastic moisturiser too! Great review! Such a multi purpose moisturiser. I like it when u say it can be applied on the lips.Is it suitable for very oily skin? I love your detailed reviews. The ingredients of this sound sooo nice! N ur right why dilute it with water?! @Lavender - Yes, the Rose cream is great for all skin types, as it will naturally balance the skin. The natural Shea butter and Jojoba are non-comedogenic, ie they will not clog you pores and will allow the skin to breathe. Rose Oil and Rosehip seed oil are amazingly nutritious and caring ingredients, too. In your case, you'd need to use even less than usual. And you know what they say - oily skin wrinkles less and ages better! Gosh, I wish I didn't have such sensitive skin. =\ (Essential oils tend to break me out) I love though that this sounds like a product I can use on my hands/body. Thanks dear for the and thanks to Boris for the explanation.